What did Titanic look like at night? The famous L’Illustration picture of her at Cherbourg has been criticised as ‘touched up’ because it shows smoke emanating from her fourth, dummy, funnel. This single improvement renders the rest suspicious. What about those two lights on the mainmast? The very bright reflections on the water in the foregound? 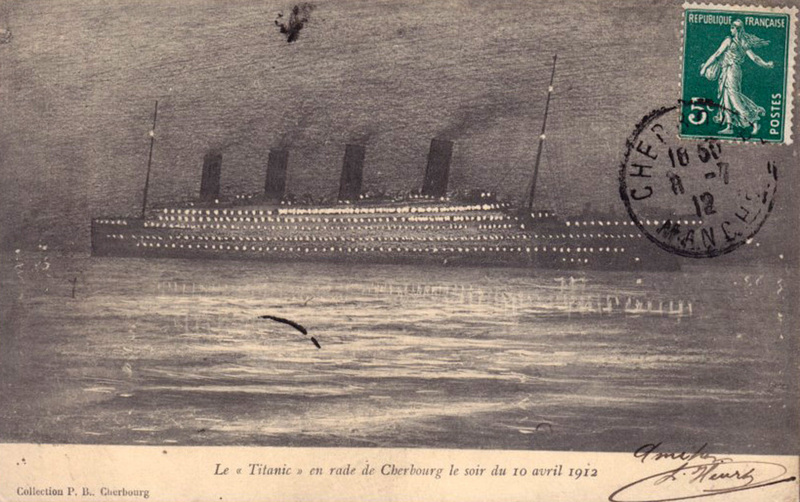 Yet it turns out there is a scarce French postcard, showing the vessel’s port side instead of her starboard, again with the same mainmast dual light arrangement, a lot of reflected light on the water in front, and yes, smoke once more pouring from the fourth funnel. Are these both highly unreliable because of touch-up, or did the Titanic really look like this after dusk fell? Could they be generally accurate? 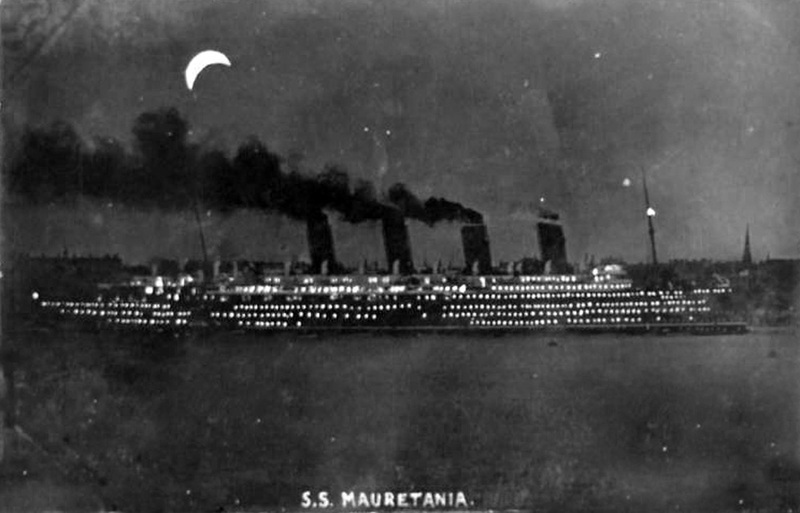 Here is a picture postcard of one of Titanic’s Cunard rivals, the Mauretania, at night. This competitor liner, sister of the Lusitania, was one of the new breed of ocean aristocrats that White Star was so keen to emulate. If this picture may have been touched up too, does it nonetheless represent what such four-funnel leviathans looked like at night, broadly speaking? 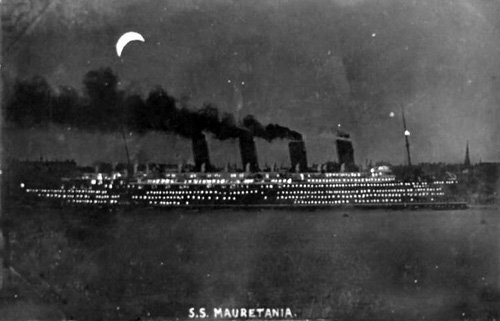 The Mauretania in the above card does not display much foreground reflection on the water, unlike this modern image of the cruise ship Ecstasy, which is specifically lit to impress. 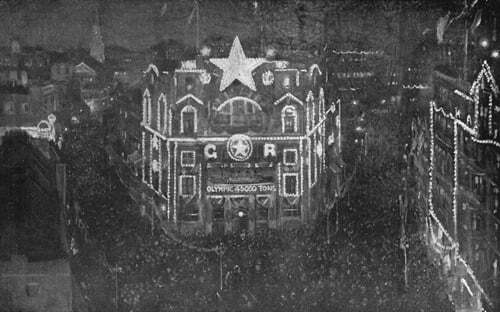 Now consider this picture of the White Star Line offices in Cockspur Street, London, illuminated for the Coronation in 1911. Oceanic House looks like a brilliant beacon, with 3,000 lamps lit, according to the accompanying caption. The Titanic a year later had 10,000 electric lights according to the Description of the Ship from the British Report. 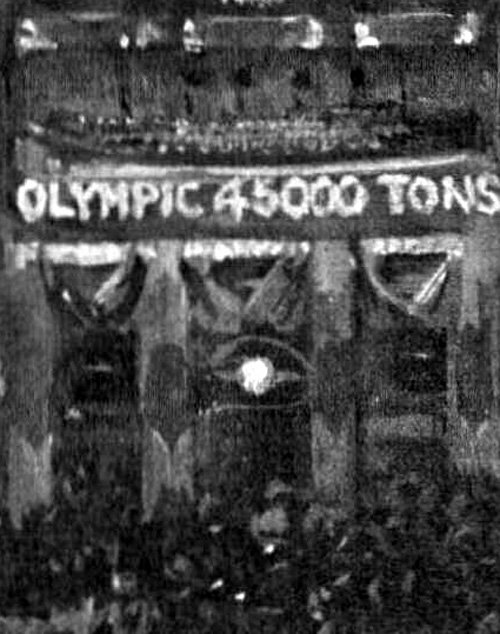 Interestingly, below the large star and the circled star – with the letters G and R on either side to symbolise Georgius Rex (the new King George V) – there is an illuminated depiction of the Olympic. She had recently made her maiden voyage across the Atlantic in five days, sixteen hours and 42 minutes, the caption declares. 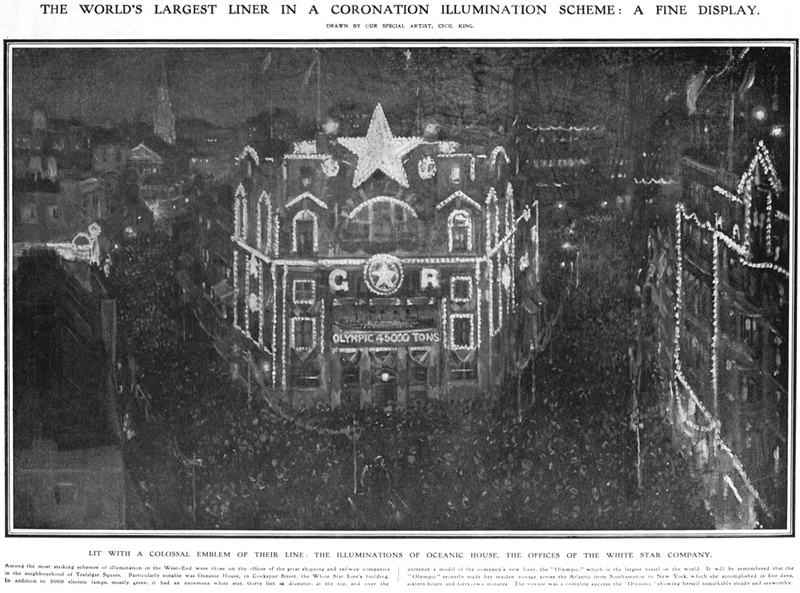 The picture is from the Illustrated London News of June 1, 1911. 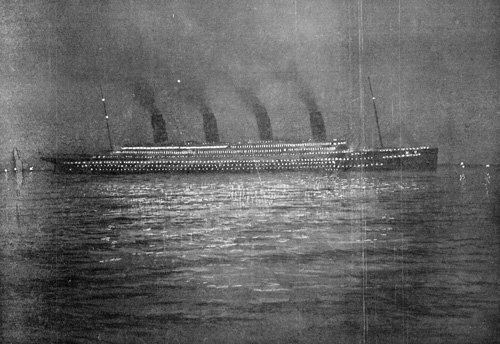 Does this generally represent, according to the White Star Line itself, what these vessels looked like at night? Are all the general pictures generally the same? 2558. Were the lights burning on the ship…? — They burnt practically until she disappeared. 10127. — The light was burning brightly. 175. We stopped there (‘a long way’ off – Q. 170) and watched her… We could see the people about on the deck before the lights went out. 1214. When you had gone about a mile’s distance away, did you see the Titanic then? - Yes, Sir; I saw the lights. 4107. When you went away in the boats, did you see any lights? — Yes, the lights were burning. 6359. — The electric lights were burning right to the very last I saw the time by my watch at a quarter-past two. 10453. Were you facing her when she went down? — Yes. 10454. Were her lights burning? — Yes, the lights were burning. 10455. Up to the last? — Yes. Many descriptions given in the press by survivors had the Titanic ‘lit up like a wedding cake’ or ‘like an hotel.’ Charlotte Collyer's 'enormous glow worm' has the ring of truth. If the above quotes generally reflect what the postcards and illustration also reflect, then we can perhaps agree that the Titanic was probably much more brightly lit that the average passenger ship. 18087. — I saw a big ship lit up, and we turned round and went back to her. 7720. — A passenger boat is generally lit up from the water’s edge. The above illustrations would tend to bear him out. The more decks a passenger ship had, the more tiers of light. 7728. — and there was nothing at all about it to resemble a passenger boat. 7548. [You were] four to seven miles away? — Yes. 7549. And you thought she was a tramp steamer? — Yes. 7792. Had you a discussion with the Second Officer as to whether this vessel was a tramp or not? — Yes. 7793. And did he agree with you ? — Yes. 7504. This was a passenger steamer? — No, Sir. 7705. You said you thought this was a tramp steamer? — Yes. 7706. Why did you think so? — She had no appearance at all of a passenger boat. 7707. What time did it first dawn on you that this was a tramp steamer? — As soon as I looked at her. 7713. — I could see this white light. 7714. Only this white light? — That is all. 7719. And when you looked through the glasses what could you see beyond the masthead light? — Her red side-light and a faint glare of light on her after deck. 7795. How long have you been at sea? — Three and a half years. 7796. And have you seen passenger steamers? — Yes. 7797. Large passenger steamers? — Yes. 7798. And medium-size steamers? — Yes. 7799. Seen them at night? — Yes. 7800. And have you been able to tell the difference between a large liner like the Titanic and a tramp? — Yes. 7801. From the appearance of her lights? — Yes. 7802. From the height of her lights? — No, from the quantity. 6990 — I am positive it was not the Titanic. 6991 Why not? — Because a ship like the Titanic at sea it is an utter impossibility for anyone to mistake. That should be true. The quantity of Titanic’s lights is true. 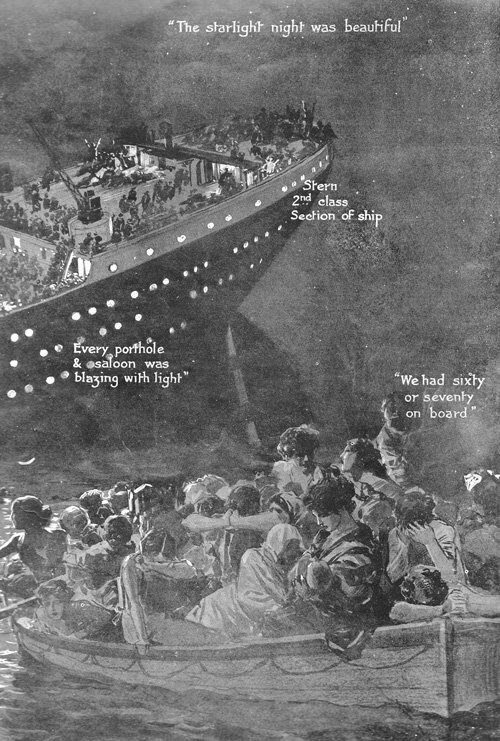 If it is true, and all the foregoing illustrations generally true, then the Californian (leaving aside all other arguments) was evidently not looking at the Titanic. Apply your own common sense! 8484 What lights was she then showing [11.45pm]? — Two masthead lights and a side light, and A FEW MINOR LIGHTS. 8485 Some deck lights? — A FEW deck lights, yes, that is what I could see. 8486 Is that before or after you say the deck lights had gone out? — That was after the deck lights went out. The tiered lights of the Titanic were therefore far over the horizon, and she herself was looking, in her early death throes, at another steamer that had manifested herself – the Mystery Ship.